There is a popular misconception that plain wedding rings or wedding bands will be unattractive and, with an occasion like a wedding, should call for something a lot more ornamental and eye-catching. People who believe that simplicity is style will agree that a plain wedding ring has an appeal all its own. The plain wedding ring may be unadorned but it will certainly look elegant if you make the right choice. Besides, the plain wedding rings need not necessarily mean that they should be absolutely plain. You can always have some unique engravings on the ring to add to its charm. Sentimentally speaking, there are also those who argue that plain wedding rings represent the special love of the bride and groom and symbolize a perfect union. They also say that the simplicity of these plain rings conveys to the wedded couple that all they need, for the rest of their lives, are each other. 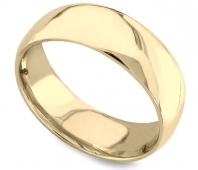 Plain wedding rings can be made with different metals – yellow gold, rose gold, platinum, white gold, silver etc. 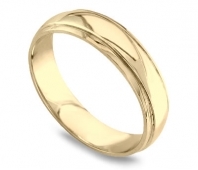 You can opt for a plain wedding ring with various sizes like 3 mm widths and even 1.5 mm wide. This different sized rings will assuredly grab the attention of the wedding guests and make a statement. White gold wedding rings produce perfect symmetry and resist scratches. A plain wedding ring made of white gold offers style, elegance, and a special appeal that any wearer can feel legitimately proud of. 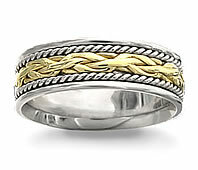 The yellow and white gold wedding rings are the favorites with many brides and grooms. The plain wedding rings from Novori Jewelry are also made in 18k gold with extraordinary craftsmanship. There are 24 karat gold rings made but they are more susceptible to bending and going out of shape because gold is a soft metal. Hence, most brides and grooms prefer 14 karat or 18 karat gold, with 18 karat being more popular. 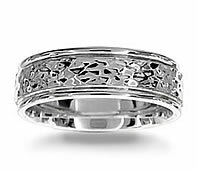 A plain platinum wedding ring does not need extra adornment or markings, as it is beautiful in its simplicity of design. Besides, platinum rings are predominantly made of pure metal (950 platinum) and thus carry exceptional luster surpassing gold and silver. Precious gemstones, and other adorning found in many wedding rings are no doubt enchanting but still many prefer only a plain wedding ring that carries its own weight because of its unique elegance and graceful simplicity. During earlier times, plain wedding rings were traditionally very heavy and uncouth whereas today they are lot more slim and stylish – but retaining the same richness in a narrower form. The latest trend is a two-toned plain wedding ring that is made by mixing metals. Some couples select a platinum ring with specks of yellow gold or a yellow gold base with a designing in white gold. But those who cannot afford such combination choose relatively more affordable metals such as titanium or tungsten carbide as a base for the plain rings. However, when selecting a plain wedding ring, make sure the ring suits your personality and your finger shape. 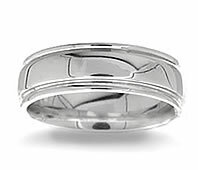 The high polished surface of the plain wedding rings provides a natural sheen and a perfect finish.